Mornings are pretty slow in The Kandy House, our home-away-from-home perched on the side of the hills surrounding Kandy’s central tank (lake). Here our two storey brick, tile and wood abode wakes to the mist that surrounds us, screening the jungle and river below. The suburb of Primrose Gardens is a collection of villas and embassies that has escaped the chaos of Sri Lanka’s second largest city to its surrounding jungle-clad hills. Kandy was once the seat of the island’s Royal Family, and later the sanctuary of the colonial-era Brits escaping the heat of summer on the coast. My Burgher grandmother (a term for the descendants of the Dutch colonists who arrived with the VOC) used to recall the time when “Society” would pack their bags, tea chests and staff to escape to this Hill Station for the “season”. The social circuit was relocated from the mansions of Cinnamon Gardens, a suburb in the coastal city of Colombo, to their villas in the cooler hill areas. Excuse me for my little colonial-era reminiscing. Back to 2015 and The Kandy House. Our little villa has no staff and “Society” hasn’t discovered us quite yet. Our Kandy abode has its toenails clenched on the side of a verdant hill, surrounded by other testaments to architectural and engineering wonders. Primrose Gardens has one road that snakes from the traffic-laden Colombo to Kandy Road, winding its way on a switch back path from the valley below to its peak a few hundred metres in the clouds. 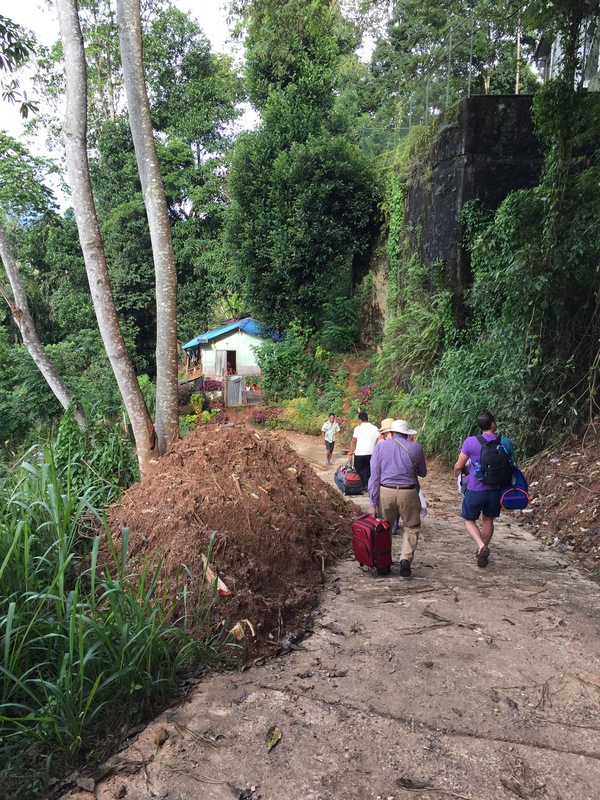 Our Air BnB accommodation is down a lane which, due to a recent landslide and steep decline, no car or even tuk tuk can traverse. The tuk tuk driver who delivered us from yesterday’s shopping expedition offered to drive us down the muddy and potholed two hundred metre lane to our house, but warned he would never be able to get his little three wheeler back up! His two stroke engine was no match for our steep driveway. As isolated as it is from “Society”, we’re not alone. 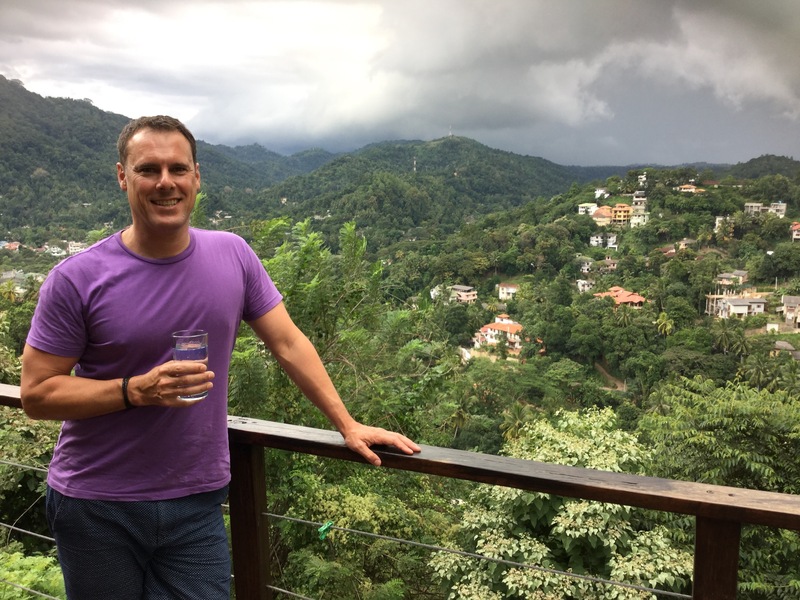 Located as we are in the trees, we have the constant bird life to look eye-to-eye with, and the owner warned us of wild boar, monkeys and vipers in the garden. To keep the mosquito population down we have the ever-present geckos. Every morning I sweep up a mixture of dead moths and gecko poo from our tiled floors. I’m still questioning why I told the houseboy we wouldn’t need his daily visit. This morning as I watched the bird life while sipping my cup of tea, I was jolted by a squeak and furry thud from the rafters above. We were paralysed with confusion, me with what to do next, and the rat with where to hide. This Mexican stand-off lasted for a couple of minutes while I tried to process that it wasn’t only gecko poo I’ve been sweeping up in the morning, and also how to stop the rodent seeking sanctuary in my bedroom. Ratty lay perfectly still, trying to work out if I’d noticed his furry descent from the rafters. Then it was on, Mike with the broom, the rat’s nails sliding over the polished tiles, and me supervising. Someone needed to direct the “big picture” and determine the best strategy for eviction. We now sit calmly having another brew, the rat out in the rain (for the time being) and us seated pondering that the only “Society” to call on us so far has whiskers and a long ugly tail. Postscript: Mikey the Rat Terminator just let out a girly scream as another furry rodent free-fell from the ceiling. The encounter was so close he shat on his descent. The rat shat on Mike’s shoulder, that is; I haven’t checked Mike yet. Disclaimer: The previous statement regarding Mikey’s exclamation is in no way meant to be demeaning to the female gender; however, it was high pitched and falsetto. This entry was posted in Sri Lanka and tagged Burgher, Kandy, Kandy House, Sri Lanka. Bookmark the permalink. Love these stories. Not sure at all about the rats in the rafters, is the netting just for mosquitos , or to catch the falling rats? Enjoy your holiday! That’s just a baby rat!